From Goodreads: "Galen is the prince of the Syrena, sent to land to find a girl he's heard can communicate with fish. Emma is on vacation at the beach. When she runs into Galen — literally, ouch! — both teens sense a connection. But it will take several encounters, including a deadly one with a shark, for Galen to be convinced of Emma's gifts. Now, if he can only convince Emma that she holds the key to his kingdom . . .
Told from both Emma and Galen's points of view, here is a fish-out-of-water story that sparkles with intrigue, humor, and waves of romance." See below the bump for the review! I have been wanting to read Of Poseidon for a while. When it was first released I just couldn't get over how gorgeous the contrasting colours of the cover were. Gave me goosebumps! I have had this one sitting on my to-read list for yonks when my friend Jade saw that and said she had it and I could borrow it! *Squee! * So thanks Jade!! 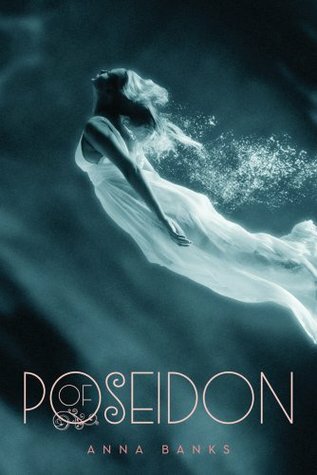 Of Poseidon is the first in a thrilling series revolving around mythology. Very exciting for me as I haven't red too many on the topic! First of all there is Emma, just your average teenage girl. Or so she thinks. Emma is pretty shy when we first get to know her, but we see that she can be fiery when need be. She has great power she knew nothing about. While she is on vacation and at the beach with her white blond hair and pasty skin she comes across the most gorgeous boy. By comes across I mean she runs into him. Literally runs into him. Awkwaaarrrd! What a klutz! Not far into this story Emma and her best friend, while at the beach, encounter a shark. It's not often in Young Adult books, particularly ones that aren't thrillers, the author's include gruesome details. But Anna Banks is not afraid. She includes, in pretty gruesome detail their interaction with the shark. The shark latching on to her best friends legs, not being able to wrench free and the pool of red that surrounds them. What a way to start a book! Though it was definitely not what I was expecting, nor did it completely sit right with me, I felt that it was crucial to the story line for Emma. Galen, ahhemmm, Prince Galon. After hearing word of a girl in the human world who can supposedly talk to fish, Galon and his sister swim to shore to investigate. Upon getting there Galon feels a strong pull, a very strong pull. A pull that he can only feel when there is another of his kind around. It's unusual that he should feel this on land, and whats more unusual is that he is the only one who feels it. Galon and his sister are at the beach just chin-chilling, when, yeah you guessed it, Emma walks into him. But how could it be that Emma is one of them when she looks so incredibly different? Different skin tone, different hair colour. But those eyes. She has the eyes. All of Emma's life she thought she was human, only to find out by a perfect (and I do mean perfect!!!) stranger, that she is in fact Syrena. And then she finds out that she is neither!! Where does that leave her?! While she is figuring all this out she is supposed to save the entire race of Syrena? A species she has only known existed for all of 5 minutes? INTENSE! Of Poseidon is a truly gripping story with characters you love to hate and even some you hate to love. With references to Atlantis, a topic I love to read about, I thoroughly enjoyed this emotional roller coaster. I highly recommend Of Poseidon to those who enjoyed My Soul to Take by Rachel Vincent. Similar themes with a very different concept, both of which I find to be pretty unique! So what do you think about Of Poseidon? !